Benedict Cumberbatch and Chiwetel Ejiofor in 12 Years a Slave. 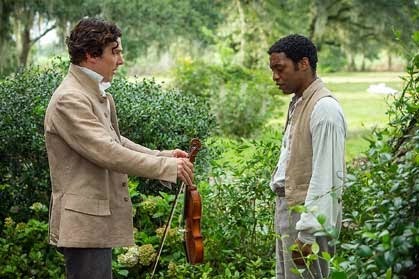 In 12 Years a Slave, which opens on Friday, gifted actor Chiwetel Ejiofor stars as Solomon Northup, a New York State citizen who is kidnapped and forced to work as a slave on a plantation in New Orleans in the 1830s. At the start of the film Northup, who is a talented musician, is deprived of his liberty and separated from his adoring wife and family. For 12 harrowing years he is forced to live like a barn animal, under the watchful eye of cruel slave owners like Edwin Epps (magnificently played by Michael Fassbender) who would have no hesitation to hang or shoot him without a second thought. What makes the film so hard hitting is that it is based on a true story. Northup was a real man and the film is closely based on his famous account of his life as a captured slave in Louisiana. That the events in this film actually happened gives it an extra dimension of authenticity. 12 Years a Slave is a real life horror film, in other words. The white columned plantation that Northup works on quickly begins to resemble a Nazi-era concentration camp with guard towers and terrified inmates. Here the axe can fall at any moment for something as simple as looking at a slave owner the wrong way. No one is ever safe. Because of these facts a sense of an all enveloping dread haunts almost every scene of the film, first because we realize that Northup is being hoodwinked by smooth talking white gentlemen who are in fact leading him to his doom, and then because of the actual horror of finding himself in leg irons being transported to a slave plantation. Because he has always lived as a free man, Northup’s terror at what is happening to him is shared by the modern audience’s terror that these things actually happened. On the slave boat to the plantation Northup is coached by the other slaves about how to behave. Don’t look white men in the eye too directly, don’t offer a smart word, don’t question any order and you might just live, he’s told. When he reaches the plantation we watch as Northup desperately tries to stay alive in a system that has been crafted to work him into the ground. He is sustained only by the thought of escape and being reunited with his beloved family, but any hope of help from others who discover he has been kidnapped are quickly dashed because it turns out that even principled white people are as intimidated by the system of slavery as the black people who live under it. Northup is literate and intellectual and he can write, three facts that he is told would get him killed if they were discovered. He cannot seem too smart and he cannot be too subservient either. Trying to outpace the suspicions of the white people who exploit him is the only way he will survive. Fassbender’s character in particular is fascinated by the thought of breaking Northup, who he realizes poses a threat to his established order by being too competent and too smart. Northup is slave owner Epps’ property, he reminds us, to be owned, used and abused as Epps sees fit. “That’s scripture,” spits Epps, quoting the Bible, which actually says a slave should do as his master bids. “There is no sin,” in mistreating a slave Epps thunders, since a slave is property and a man may do what he likes with his property. But British director Steve McQueen never allows Fassbender to become a mad-eyed slave owner menacing his noble slaves. Instead the film pulls back from big sweeping emotions to show us how damaging the slavery system is to literally everyone who lives under it, including the slave owners themselves. In 12 Years A Slave white people are shown rationalizing the exploitation they’re practicing; black people are shown rationalizing the exploitation they’re experiencing. It’s a complicated, poisonous dance. So what McQueen has accomplished is finer than just a meticulously crafted reenactment of a true story about slavery. The film actually shows us the damage that slavery did to both slave and master. That is ultimately what makes it so hard hitting. Ejiofor’s performance is Oscar worthy, as is Fassbender’s in his supporting role as Epps. Ejiofor’s delivers not just the best male lead performance of the year, it’s one of the greatest ever committed to film. If you only see one film this year, make it this one.